Though this episode does set up future events, like last week it feels more like filler than anything else. As some of the villains question their faith and our heroes find a way to push forward, the issue of clunky writing is strong in ‘Lost’, despite featuring one of the more touching sequences in the volume so far. ‘Lost’ opens with Emerald sitting contemplating while Mercury trains around her. They talk about their current situation, when Emerald asks Mercury why he bothered joining her and Cinder, with Mercury replying, ‘It just made sense’. When she probes him further, Mercury explains that his father trained him his whole life to be an assassin, and that when he finally killed him, Cinder and Emerald showed up shortly after looking for someone with his set of skills. Unconvinced, Emerald asks him what he wants from this, with him giving the simple answer that Salem promised them everything, ‘what more could you want?’. Emerald sadly replies to him that Cinder was the only family she ever had, an answer that Mercury quickly shoots down, making the observation that Cinder didn’t care about either of them, causing Emerald to lash out at him. As the two start fist-fighting, Mercury tells her more how his father abused him, and how he had to constantly fight to get where he is, which causes Tyrian, who has been hiding in the shadows, to come out giggling and mock him. Mercury goes to attack him, but Tyrian almost immediately gains the advantage, hovering over him as his new mechanical scorpion tail looms menacingly above his face. Having listened to the whole conversation, Tyrian makes a point that they’re asking the wrong question, and ‘If you’re not loving what you’re doing, then you’re in the wrong field’ (surprisingly good career advice from a psychopathic murderer). 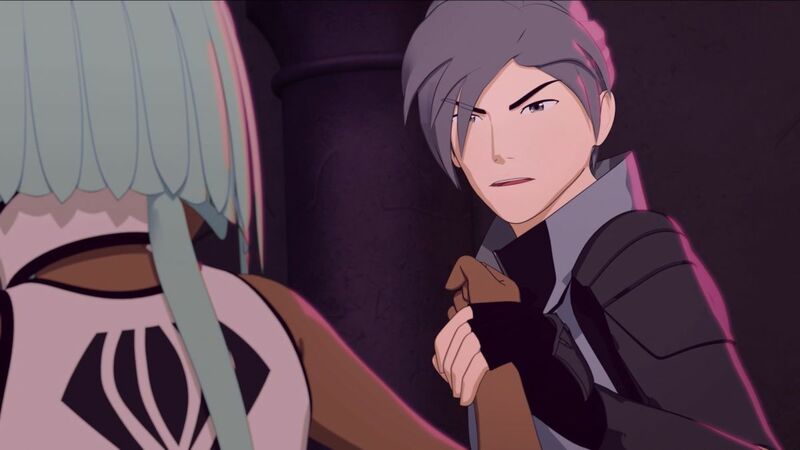 He also reveals that he and doctor Watts are moving to Atlas to make their next move, in case Ironwood calls on the other kingdoms for aid, setting up another potential threat for team RWBY. He leaves the pair, menacingly adding ‘do what makes you happy, children. Please? I’m begging you.” (Again, sound advice). The episode cuts back to Argus, with Jaune, his sister Saphron, Ren and Nora go looking for Oscar. As they continue investigating, Saphron – who has been kept out of the loop of the details of the team’s mission – offers them an alternate lifestyle when Ren says that they are unsure of what they should do. When Jaune shuts her down, she goes back to pick up her son, leaving the three to their own devices. Nora offers that they get coffee, something that Jaune again rejects, going to sit on a nearby bench to think. It is then that Jaune finds a memorial statue of Pyrrha Nikos, an effective punch to the gut for him and the audience alike as a slow piano piece and Casey Lee William’s vocals take over the scene. A woman with the same red hair and green eyes as Pyrrha joins him with a bouquet of flowers, telling him that the reason the statue is there is because she trained there. As the two mournfully talk about her, they eventually arrive at the conclusion that though her death was tragic, she did her duty as a huntress and she wouldn’t regret her decision. It’s then that Ren calls out to Jaune, making the woman leave her flowers by the statue. As Nora goes to ask Jaune why he went off, she cuts herself off when she sees the statue. Jaune goes to apologise for his actions, but Ren and Nora speak over him, telling him that they love him, and they can’t lose him too. As they turn their attention to Pyrrha, they promise to each other to fight with her memory, before heading back to see if Oscar went back. This is a heart-breaking sequence, and it’s a nice way to remind fans of what the group have lost, though the writing feels a little off towards the end of the scene. Back at the house, Ruby and Yang find Qrow drunkenly passed out on the front steps, waking him up just as the rest of the group return with Tara and Adrian. Though their search for Oscar was unsuccessful, Jaune promises that they won’t leave for Atlas without him. Just as Tara offers that they should get in from the cold, the front door opens, revealing Oscar in a suit of combat gear, which begs the question – where’d he get the money for that, and why? Oscar points out that he started cooking as a way to make peace with the rest of the group since they went out looking for him, with Jaune coming forward and apologising for his actions, something that Oscar accepts. Though he fears that he won’t be himself for very long, he tells the group he wants to do what he can while he still has the ability to be himself. As Tara and Adrian go into the kitchen to finish off Oscar’s meal, Qrow climbs the stairs, saying that he doesn’t want to ‘interrupt your little celebration’. When Ruby pushes him to just spend time with them, he bitterly remarks that despite all of what just occurred, it doesn’t bring them closer to Atlas. When Jaune offers up his idea of stealing an Atlas military airship since they are the only ones allowed in Atlas airspace, he gets questioning from the rest of the group, with Qrow finally shooting down his idea. This visibly brings down the morale of the group, causing Ruby to argue that she wants to hear Jaune out anyway. She goes on to say that whether it’s Qrow’s efforts to protect them or lack of faith in them, she doesn’t really care what he thinks, and they’ve always kept going against all odds. The episode concludes with Maria chuckling and saying that Qrow doesn’t give his niece enough credit. Though this episode does set up future events with the villains going to Atlas and the group finally deciding their next move, like last week it feels more like filler than anything else. The sequence about remembering Pyrrha was nice and the strongest point of the episode, but there are still a couple of problems with it: the whole conflict between Oscar and Jaune felt pointless and like it was implemented to fill in the volume. Perhaps instead of concluding it over two episodes, it could’ve been stretched out a bit longer with Jaune still being weary of Ozpin or just cut out altogether. The dialogue doesn’t flow as well as it could’ve, especially towards the end of Jaune, Nora and Ren’s interaction about Pyrrha. Finally, there’s Qrow, a previously strong and likeable character, now being the equivalent of a fussy man-child – all told, this episode has probably been the weakest of the volume. Also, what was the point in Oscar getting a new set of clothes? The costume’s design is gorgeous, but I think the same message of Oscar going through a mental change would’ve been conveyed just as well if he had just stayed in the same outfit. Hopefully, the audience can look forward to an action-packed episode in the future. Though it does treat fans to a nice call-back of a beloved character, the conclusion of a meaningless conflict and some clunky writing takes away from an otherwise decent episode.